Only America does hot rod SUVs right. Yes, there are many high-performance SUVs in the marketplace today, many of which come from Germany. Audi, BMW. Porsche. Mercedes-Benz. You’re familiar with all of those brands. Perhaps, however, it’s America that truly does the high-performance SUV best, combining crazy performance specs, a powerful engine and luxury all in one package – for less than six figures. That’s the 2017 Jeep Grand Cherokee in a nutshell. We just sampled one and our lives are forever changed (that is until the Hellcat-powered Grand Cherokee Trackhawk comes out, and our lives will be altered once again). 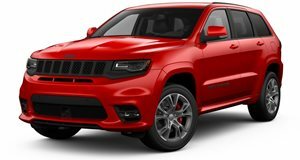 Powered by a naturally aspirated 6.4-liter Hemi V8 with 475 hp and 470 lb-ft of torque, the Grand Cherokee SRT blasts from 0 to 60 mph in only 4.4 seconds. Top speed? Try 160 mph. In a 2.5-ton SUV. What we also adore is that Jeep equipped its flagship Grand Cherokee with the Quadra-Trac Active on Demand 4WD system, meaning you can go off-roading and not worry about a thing. And when you’re done, you can head to the dragstrip. Step inside and you’ll find a luxurious interior equipped with just about every bell and whistle you’d desire. Compared to the BMW X5 M and Porsche Cayenne Turbo S, the Jeep Grand Cherokee SRT is a bargain. Our nearly fully-loaded tester cost $81,250 (base price $66,895). Those also cool German-built SUVs? Around $100,000 and $150,000 base price, respectively. America. Hell yeah. Special thanks to DGDG.com for letting us film the car.